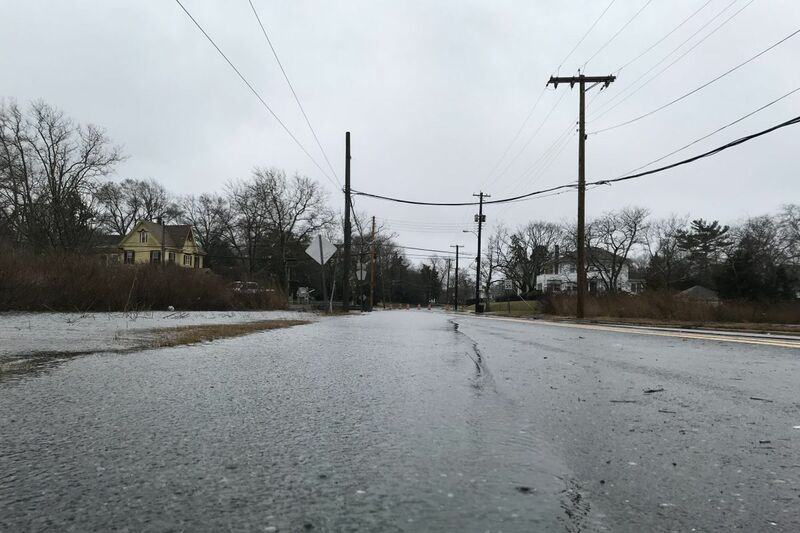 Shore Road in Absecon was closed after flooding. Friday's nor'easter might have rattled stop signs and made life miserable for residents at the New Jersey Shore, but flooding remained tame. Winds blew the snow horizontally, rattled stop signs and whipped the water frothy on Friday, but most at the Jersey Shore were thankful it stopped there. Shore Road, just off Route 30, was closed in front of Brenda Ruppert's Absecon home, perched on a hill. Water had flooded the street forcing police to block it. A large pickup truck churned through nearby, almost getting stuck as the water reached the running boards. "This is nothing," said Ruppert, smiling. "This is a baby." She and her longtime neighbors gauge potential threat by how far water creeps up on her lawn, and whether it reaches her driveway. Friday's high tide didn't even reach her lawn – unlike a full moon high tide just a month ago. "Sandy came up to our fourth step," Ruppert said of the 2012 superstorm. Water forced the closing of Shore Road by Brenda Ruppert’s Absecon home Friday. But although the nor’easter rattled stop signs and made life miserable for residents at the Jersey Shore, it wasn’t nearly the flooding debacle other storms have been. And so it went at the Shore during a powerful nor'easter – caution mixed with relief. The winds, strong as heck, were blowing in the right direction – keeping the water at bay. Although they were wreaking havoc with power. Around 7 p.m. Friday, AC Electric reported 22,700 customers without power, with a majority of them more inland. Atlantic City's storied boardwalk was nearly empty in the morning. But thousands slowly trickled in for New Jersey's high school wrestling championships as gale-force winds came off the beach – buffered by dunes and casino fronts. Dan Miller was headed on foot to Boardwalk Hall with his son, Dominic. They had come to see Miller's other son, Danny Jr., wrestle for Watchung Hills High School. Did Miller think of canceling? "No way," he said with a grin. "I would never cancel. I have waited a long time for this." Dan Miller and son, Dominic. They were in Atlantic City for state wrestling championships, where another of Miller’s sons, Danny, was wrestling at Boardwalk Hall. The weather might not have been as bad as some expected, but it nonetheless made conditions more difficult for firefighters in Ventnor, called to climb on the roof of a burning home at Atlantic and Roxborough Avenues. One firefighter was reportedly taken to a hospital for smoke inhalation. Conditions were harsh for firefighters putting out a house fire in Ventnor off Atlantic and Roxborough Avenues. Overall, though, the Shore largely escaped the destruction of past storms. The National Weather Service was advising that minor flooding would occur, escalating to moderate flooding with high tide between 7:45 p.m. and 8:45 p.m. Surges of around 1½ feet were expected. Saturday and Sunday could be worse, however. Tidal surges of up to 3 feet were expected Saturday, possibly even higher Sunday. But, for Kevin Morris, of Beasley's Point, that was good news. Morris, a manager at Heritage Surf & Sport in Margate, was working in the store Friday. It remained open until its usual 6 p.m. closing, with a few customers stopping by. "Oh yeah, I'm looking forward to it," Morris said of surfing in waves that the National Weather Service said might build to 9 or even 12 feet. "The swells are expected to be good. This will be the biggest swells of the winter for sure." Conditions, however, worsened at night during high tide. Avalon Boulevard was eerily dark heading into town from Route 9, punctuated only by driving snow. The bay grew violent with glimpses of crowded whitecaps visible under an occasional street light. Docks shook and rattled. Some streets flooded but were still passable. Both Avalon and Stone Harbor were largely deserted with any remaining residents hunkered down. Most were waiting for the next high tide between 8:00 and 9:00 a.m. Saturday to see if flooding worsened. Indeed, though winds were expected to die down Saturday, flood warnings remained in effect through Sunday.